SPIROL can produce Thin Shims with or without a tool in any flat configuration including highly complex, non-symmetrical geometries. (To put this in perspective, a standard piece of paper is 0.1mm (.004”) thick.) 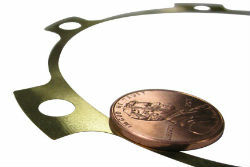 In addition to conventional stamping technology, SPIROL can produce extremely Thin Shims by S.W.A.T. (Stamping Without a Tool). This proprietary stamping method can be used on parts less than 0.25mm (.010") thick. Our statistically capable process produces Thin Shims with one-hit and no burr. For Thin Shims greater than 0.25mm (.010”) thick, SPIROL offers CNC Laser cutting and CNC Machining to manufacture Shims with complex geometries. All of these production methods are ideal to maintain dimensional repeatability for quick turnaround prototype and low volume production orders - and there is no tooling charge! Many Thin Shims must be heat treated to meet specific application requirements. SPIROL’s heat treating process allows us to harden Thin Shims in-house with statistically capable, proven technology to produce warp-free parts. SPIROL also stocks pretempered materials in various thicknesses that will support reduced cost and delivery by eliminating the need to heat treat. For applications that use a particular Thin Shim in multiple thicknesses, consideration should be given to converting to Adjustable Shims for ease of assembly and reduction of line item SKUs. Other materials will be evaluated upon request to meet specific application requirements.